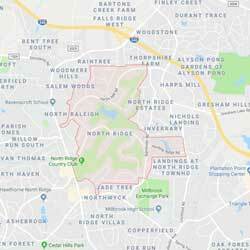 North Ridge is located in North Raleigh, NC. It is a quiet, established neighborhood with tree lined streets and stately homes on large wooded lots. North Ridge is a highly respected and well-known community that offers an upscale lifestyle for the residents. Homes built from the 1960s through 2000s. Many of the homes have been renovated in recent years. The neighborhood is home to the elegant North Ridge Country Club. Members of the club enjoy a 36-hole championship golf course, 13 tennis courts, fitness center, fine and casual dining options and a Junior Olympic pool with a kiddie zone. The 70,000-square foot clubhouse has a variety of private rooms to accommodate groups of 5 to 700 for weddings, corporate events or an intimate gathering. Close to some of Raleigh’s best attractions like Shelley Lake, Triangle Town Center, Raleighwood Cinema Grill and much more.